"Upo, upo, upo! (Sit, sit, sit!)" chanted the silver crowd when Katy Perry finally came out after about an hour's delay. My companions and I considered looking for some scalper to upgrade our tickets to at least gold, but we couldn't leave our posts anymore. "Upo, upo, upo!" continued the chanting. The gold crowd, however, still atop their Monobloc seats, merely glanced at us, probably realizing only for the first time that there were people behind them, then returned their gaze to Katy. Livid, the silver crowd, including Julia, threatened to bridge the gap between them and the gold area by either jumping across or pushing the chain-link fence forward. Marshals threatened to do something bad to us, what exactly I do not remember, but while several of them repaired parts of the chain-link fence that some of the angry mob had been successful in unfastening, most of them only whispered amongst themselves like they were coming up with a brilliant compromise to appease us, such as reiterate to the gold crowd that the purpose of their chairs is to be sat on, but really the buffed-up and highly efficient ushers only stood watching us the entire time like we were psych patients in an observation room. It was like People Power Revolution, but with Katy singing "Peacock" in the background and me not being much of an activist. I yelled a couple of statements of indignation but mostly I conserved my energy for a possible riot outbreak and simply laid out in my head a draft of the blog entry I was to write on the whole thing (nine months later, ta-da!). Needless to say, it was the most embarrassing night of my life. Because it wasn't that we couldn't afford gold tickets or even titanium or VIP. We decided to get only silver tickets so it wouldn't be too much for Maricris and me who liked Katy Perry okay but weren't really dying to see her perform live. Katy and model Ivan Dorschner whom she selected from the audience for a kiss. Lesson learned, which should have been obvious to us since the beginning: the pricier the ticket, the better the view, though standing on chairs really is inevitable no matter how refined your manners are. 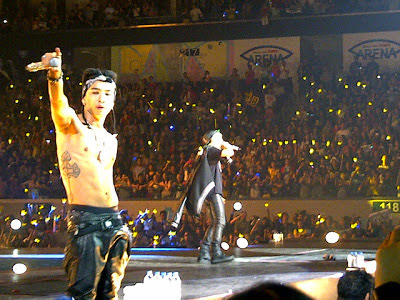 Case in point: BIG BANG's Alive Tour concert at the SM Mall of Asia Arena two nights ago. 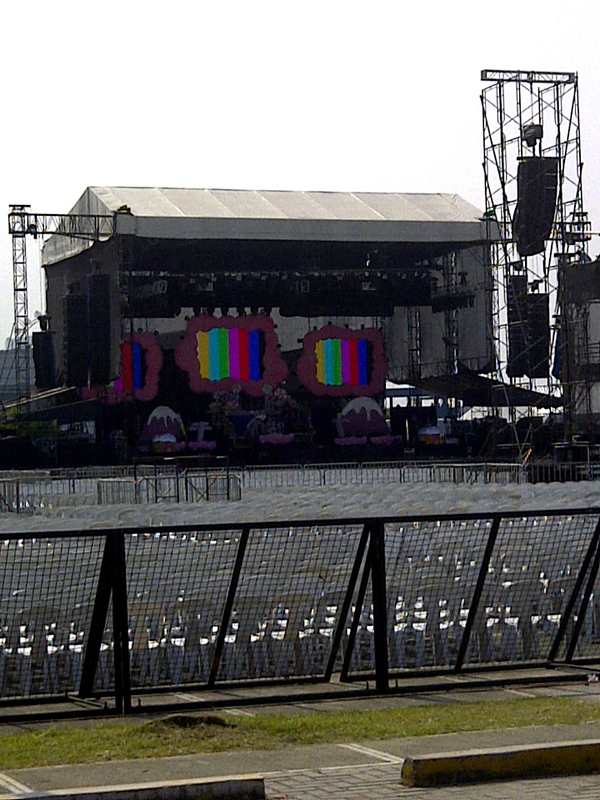 I arrived early at the venue with my co-worker Bianca, a huge K-pop fan, but we got to see the show late. We had too much confidence in the special treatment we expected to be accorded to us because we had VIP passes, so we hung about with Patrick, an online friend who was also attending the concert, watched the people who were already in line, and checked out the official merchandise being sold outside the venue. When to our disappointment we found out there was really just that one line to get in, we finally joined the queue. Only after wading through the same garbage everyone else did to reach the entrance did we feel the long-awaited privilege of having VIP passes when we got ushered into a separate queue. Getting to our section of the concert area wasn't too difficult, but we got there probably two songs into the show and discovered that they have a loose usage of the term "reserved seating" as H-22 and H-23 were already occupied and no one was actually seated anywhere because everyone was up on their seats. 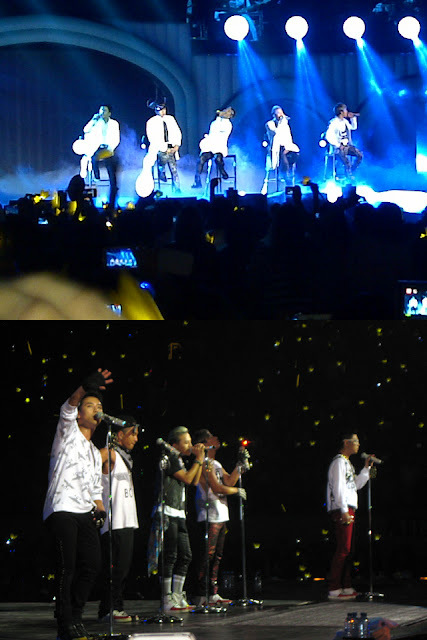 No complaints about not seeing BIG BANG, though. Except for the occasional obstruction in our view caused by floating iPads and Samsung tablets. Hey, thanks! 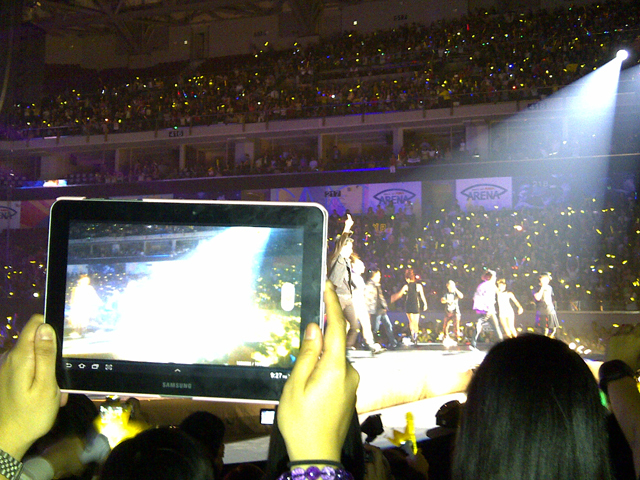 I could just watch the concert conveniently on your tablet! Even if we got cheaper tickets, however, I think we would have enjoyed the concert just fine. 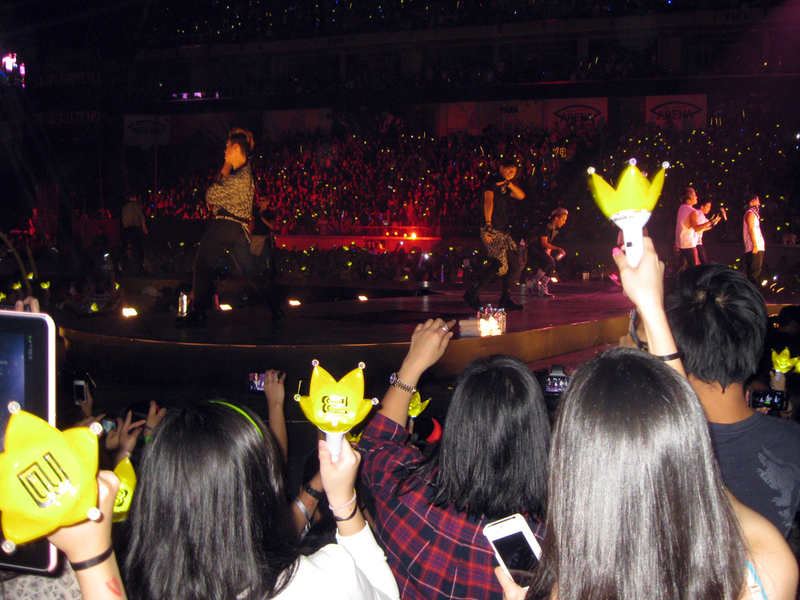 In fact, we might have enjoyed the concert more, because in the non-VIP areas, the farther the seats, the more elevated they are, so even if the person in front of you stands up, you can just get up too and your view would be unobstructed. Bianca and I, because we arrived late and didn't want to go to the trouble of fighting for our seats, simply stayed at the back of the VIP-1 section, so we occasionally still had to tiptoe to get cameras and tablets out of our sight and avoid getting hit in the face with glow sticks. We were thankfully not close enough that the bottled water the band members, particularly Daesung, liked to splash on the crowd toward the end of the show could reach us. So lessons learned from both Katy Perry and BIG BANG concert experiences: Aim for the pricier ticket if the venue's a field or something similar; otherwise, any reserved seating pass would do. Arrive early so if the reserved seating rule turns out to be a myth, you can get to the very front of your assigned concert section. And lastly, bring a camera but don't let documenting the concert get in the way of actually enjoying the event—a lesson a lot of concert-goers should take to heart. 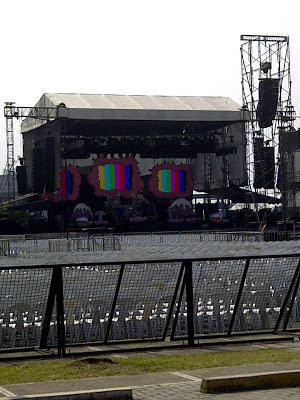 Silver sa SM MOA Arena or sa concert grounds? 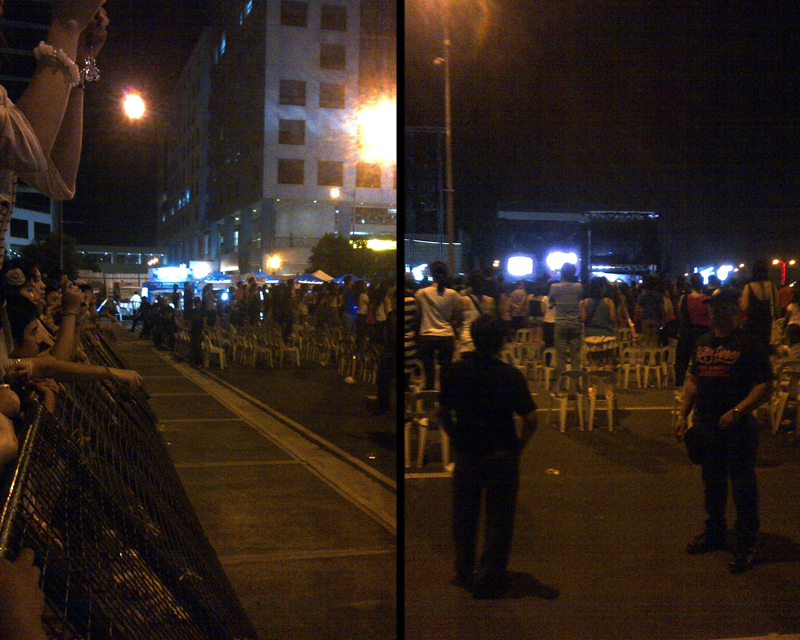 I was in the VIP section kasi sa SM MOA Arena. If it's the latter, though, yep, hindi naman masyadong malayo but with the people in the gold section standing up, the view is obstructed. Naku, I have a really bad memory which is why I like to write in my journal/blog, but I believe yes, umabot. Malaki ang crowd so I think umabot ang bronze sa second block. You'll have to rely mostly on the screens which are hopefully large enough to be projected on. Don't take videos na ha, para ma-enjoy mo fully. Have fun! And thanks for reading!